According to the Alzheimer’s Association, 5 million Americans are currently living with Alzheimer’s or dementia, and a new diagnosis takes place every 66 seconds. That means that by the year 2050 there could be upwards of 16 million cases of seniors living with Alzheimer’s disease. While there is still unfortunately no cure for this terrible disease, new treatments and services are coming out regularly to assist those affected by it. One of the services which has proven helpful for those suffering from Alzheimer’s disease is equal parts unconventional and glaringly obvious: service dogs! 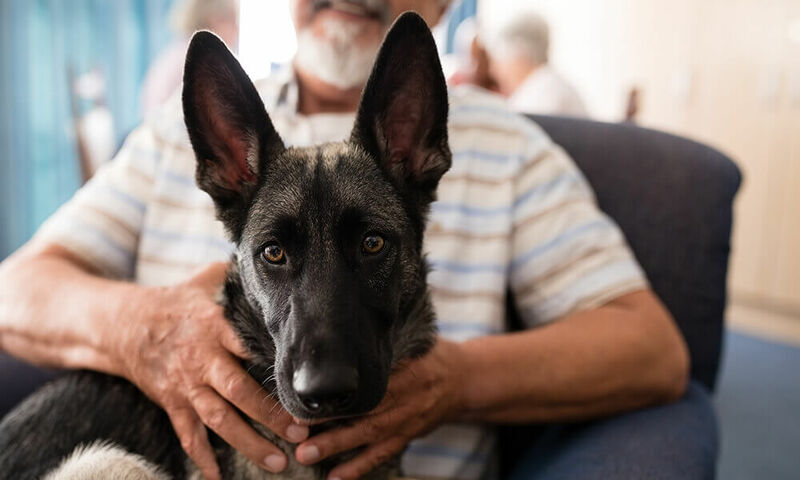 While it seems as though dementia patients would just have another thing to worry about with a dog in their lives, service animals have been clearly proven to benefit the lives of those suffering from diseases of the mind. This week, we’ll take a look at the benefits of having a service dog, the logistics of receiving one, and the possible drawbacks associated with them. 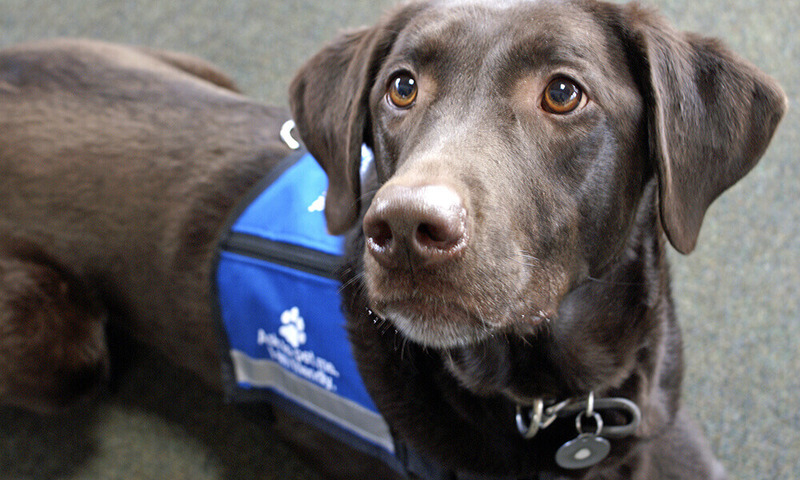 Seeing the benefits of a service dog is best done through a case study. The first recorded case study of a person with a degenerative brain disease receiving a service dog was a 62-year-old man, Yehuda, who was suffering from the early stages of Alzheimer’s disease. From the time she was three months old, Yehuda’s service dog, Polly, was specially trained by an Israeli dog trainer, Yariv Ben Yosef. Polly’s first objective was to help Yehuda find his way home when he became disoriented, helping him navigate dangers like traffic while also providing a body to lean on. In reality, that ended up as only a part of Polly’s job. Many of the emotional side effects of Alzheimer’s such as fear, anxiety, depression, and isolation were lessened greatly when Polly became part of Yehuda’s life. She stayed with him during nights when he would wake up and forget where he was, calming his fears and nerves. She insisted on playtime and was a constant companion, lightening his often depressed mood. She also made it easier for him to walk. Getting exercise and fresh air is not only good for the body of a person with Alzheimer’s; it also helps them interact with the outside world, building a more responsive attitude towards their environment without becoming unsafe. For these and many reasons, service dogs have proven their worth in the eyes of Alzheimer’s sufferers as well as their friends and families. While professionally trained service dogs are not cheap, they actually cost less than one might think. While a standard service dog can range in cost from around $2,000 to $30,000 depending on the trainer, they typically hit around the $5,000 mark. That being said, dogs trained to work with Alzheimer’s patients need a very specific set of skills. A service dog trained for a person affected by Alzheimer’s needs to be able to assess dangerous situations, often times when their owner is unable to do so him or herself. This takes years of specialized training. Not every dog can be a service dog to an Alzheimer’s sufferer; typically smooth collies have been the standard, but other large, person-oriented breeds could work just as well. One major drawback to service dogs for those with Alzheimer’s disease is longevity. Alzheimer’s is fickle and while one person may take years to succumb to a point where a service dog can no longer be of help, others get there in a matter of months. So on one hand, the investment may not be worth it for patients who the disease affects more quickly. Contrarily, some people live alone and do well for themselves with mild Alzheimer’s for upwards of 15 years. In that case, a service dog’s typical working time comes into play as they are considered reliable only for around 7-12 years depending on their health, training, and other factors. Research is important when deciding if a service dog is right for you or a loved one.